Consolidate the number of engineering programs firms have to use. 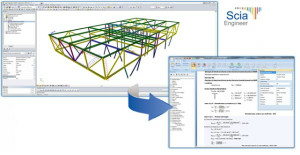 The webinar is sponsored by Nemetschek Scia and free for ENGINEERING.com members. Ben Follett, PE is a Structural Engineering Consultant with Nemetschek Scia where he helps engineering firms streamline and integrate their 3D engineering workflows. Prior to his work in the software industry, Ben was a Structural Associate with Michael Baker Corporation, an Engineering News Record top 50 AE firm.